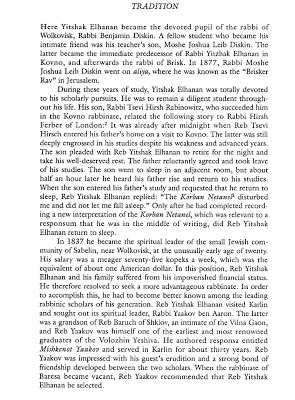 Since Dan has started down the road of trying to understand our relationship with the Kovno Rav, lets start with this biographical entry from the Eilat Gordin Levitan archive. He had four children; Son Benjamin Rabinowitz was murdered in 1906. 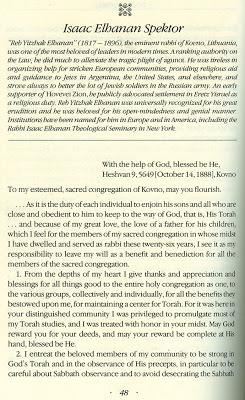 Zvi Hirsh Rabinowitz died in 1909 his two other children; a son died at age 40 and a daughter Rachel who died in 1876. Notice no mention of the Gonif, who would have died around 1855. 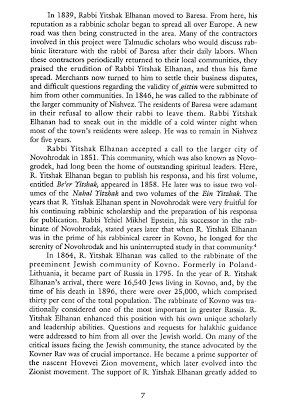 So how and why did some Spektors become Rabinoviches and how does all lof this relate to Joseph Rabinovich deciding to pull up roots and head to America in 1874, which seems very early. But hey, he must have been the smart Rabinovich/Spektor. 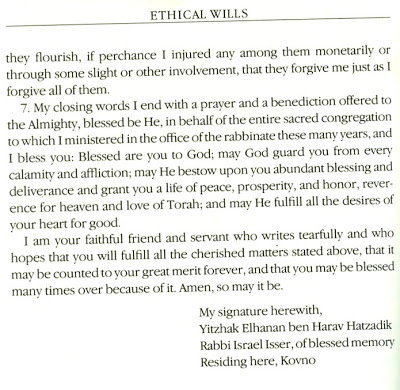 "Ethical Wills: A Modern Jewish Treasury""
Well, we had heard some time ago from Shmuel Elchonan, our third cousin in Israel, that the Rabbi Spektor's "ethical will" had been published in the 1980s in a book titled "Ethical Wills: A Modern Jewish Treasury." I finally got around to tracking down the book and ordering a copy. Here's a quick plug for Alibris.com, a online book source that aggregates the used book collections in independent bookstores around the U.S. (maybe the world). When I went looking for this title on Amazon, they had it listed but no new or used copies were available. Then I tried Alibris, and found at least six copies available at a range of prices. My copy cost $14.15 plus shipping and was actually sent from Sea Shell Books, a bookseller in Clearwater FL. It is in very good condition with a handwritten inscription by the previous owner. Anyway back to the contents of the book. It is a collection of Jewish ethical wills, categorized into four groups for Traditional Wills (mostly written by rabbis), Wills from the Holocaust, Wills from the Land of Israel, and Wills of Modern and Contemporary American Jews. The book was edited and annotated by Jack Riemer with translations by Nathaniel Stampfer. The frontispiece is shown below. 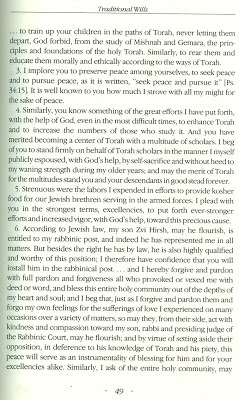 Rather than try to summarize the Rabbi Spektor will, I will post images of the full translation in the next post, and then after that tell about the other surprise that awaited in the book. 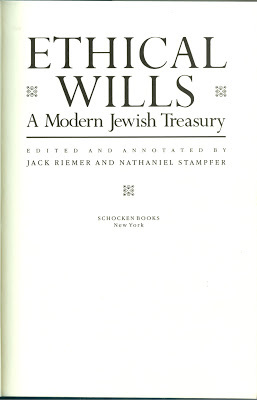 Read more about "Ethical Wills: A Modern Jewish Treasury""
There is much that can be said about this document. Perhaps readers will want to contribute their reactions in the comment section. I've run across the online site for the academic publication Tradition, a "Journal of Orthodox Jewish Thought," a few times in my research, but hadn't gotten around to paying for any downloads till today. 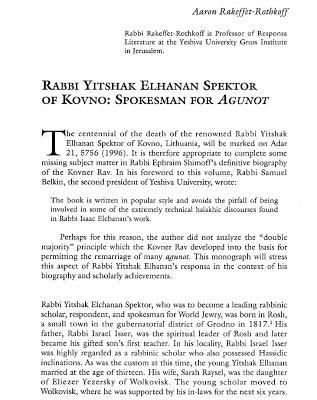 There are a number of other interesting hits to investigate, but so far I have reviewed only the journal's major article on Rabbi Spektor published on the occasion of the centennial of his death in 1997. The author is Rabbi Aaron Rakeffet-Rothkoff, professor of Responsa literature at the Yeshiva University Gruss Institute in Jerusalem. Most of the article contains analysis of YES' theological writings, focusing on two of the matters in which he was most influential, concerning the problems of shemita and aguna. In both cases, YES argued for a lenient interpretation of Jewish law, and his rulings on these matters carried great weight with Jewish communities around the world. We may come back to those subjects at a later date, but the main interest of the article for us in its biographical sections. Most of the author's information is from the usual sources, but he introduces a new source, a chapter from a 1958 book called Guardians of Our Heritage, that seems to have some intriguing new information. So here are three pages from the Tradition article in this post, and then I will follow up with the most interesting tidbit in the following post.